Much of the debate on education uses diagrams to illustrate points being discussed. Many of those diagrams are based on informal semantics. The result is often chaos. In this article, I’ll use the knowledge pyramid as an example of how informal semantics can produce confusion rather than clarity. The knowledge triangle is widely used as a way of representing levels of abstraction in information (using “information” here in the broadest sense, for reasons that will soon become apparent). At the bottom of the triangle is the concept of data – raw, unstructured pieces of “information” in the broad sense. Above this comes information in the strict sense, usually defined as “structured data” or something similar. Above information comes knowledge, usually defined along the lines of “information about information”. 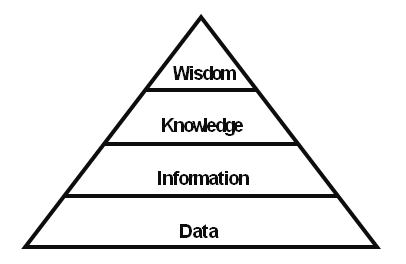 At the top of the pyramid is wisdom, with a definition such as “knowledge about knowledge” or “structured knowledge”. It’s a useful starting point, as long as you don’t treat it as the full story. This diagram implies that these four concepts form discrete levels, and gives no indication of just what each level actually contains. That’s a significant omission, since it allows people to imagine whatever they want about those contents, and about how the levels relate to each other, and about what the implications are for teaching and learning. There have been claims, for example, that if we simply present students with enough examples of the contents of a particular level, then the students will somehow manage to work out how to aggregate those examples, and will infer what the contents of the next level up will be via some form of “natural learning”. That’s the approach that Copernicus used in astronomy to work out the principles of planetary motion. Darwin used it to work out the principles of evolution. However, Copernicus and Darwin spent most of their working lives trying to discover those underlying principles. A lot of other researchers without their genius spend all their working lives on these topics without ever finding the answers. The idea that this approach could be routinely used in school-level education is somewhat reality-challenged, to say the least. Another problem with the pyramid model is that it’s often combined with an implicit assumption that the higher levels of the pyramid are in some sense more pure and noble than the lower levels. The implicit subtext is that the lower levels of the pyramid contain the basic material that the lower levels of society need to know, whereas the higher levels contain the sophisticated abstract concepts that only the educated elite can properly comprehend. Those assumptions are neither a recipe for producing good plumbers or for producing good academics, but that’s another story for another article. So what, if anything, is inside the knowledge pyramid, and why should anyone care? The knowledge pyramid is widely used in Information Technology (IT), which is part of the reason for its popularity. From an IT perspective, a hierarchical organisation of information makes a lot of practical sense. For instance, a customer record might include the customer’s name and the customer’s address; the customer’s address might include the house number and the street name and the town and the postcode. Boxes can contain sub-boxes, and everything is neatly defined. When computer scientists tried to take on more complex problems, however, they discovered that the nature of the issues they were dealing with was very different. There’s a deep, fascinating story about how researchers came to realise that the way human beings handle information is not “illogical”. The messy, imperfect rules of thumb that we use are actually the least bad option available for handling a world which is itself messy, and which is very different from the clean, simple problems favoured by formal logicians. One of the results from this realisation was the growth of knowledge representation as a field within Artificial Intelligence. I’ll draw heavily on knowledge representation in this article; in particular, I’ll draw on graph theory, which is an important tool within knowledge representation. I’ll then look at the implications for education theory, practice and policy. When you’re trying to explain the concept of levels of abstraction to a non-specialist, diagrams like the one below are a useful place to start. This representation is known within graph theory as a tree. A key feature of a tree is that as you move away from the starting point at the top, your path can only divide; it can never join another branch. In the image above, I’ve shown this via the red branch on the left and the blue branch on the right; the descendants from this initial pair of branches never re-join. The tree is a classic type of hierarchy; you meet it in zoological classification and numerous other places. It’s clean and it’s simple, and it’s widely used as a way of showing pyramid-like information structures schematically. If you’re tidy-minded, you can draw the tree with the branch points at the same level as each other, and you can use the number of levels as a measure of complexity. The example above has four levels, including the level of the starting point. However, when I drew a diagram of the knowledge pyramid in my previous article on the topic, I deliberately didn’t draw it as a tree. I drew it with two branches joining, at the “information” level, in the middle of the diagram. There was a reason for this. When you start studying human expertise, you rapidly discover that the experts’ knowledge doesn’t consist of simple, tidy trees. The world that they deal with is more complex than that, and the way they organise their knowledge is correspondingly complex. For instance, a key part in an expert medical diagnosis might be a particular very low-level piece of data, such as a patient’s temperature, which is being used within very high-level categorisation and decision-making. Expert reasoning often involves this type of mixture of levels. Also, experts typically use more than one classification system for their knowledge. An expert ornithologist might, for instance, classify birds for some purposes using a cladistic classification system, and classify the same birds for other purposes using a habitat classification system. Some of these might be trees, but others might not; for instance, some classifications systems such as the periodic table are based on a matrix layout. A further point worth spelling out explicitly is that many of the classification systems that experts use are significantly more than four layers deep – you can’t simply map the levels of a tree-style classification system onto levels of the knowledge pyramid. In summary, if you’re trying to represent expert knowledge accurately, the knowledge pyramid isn’t a good representation; it’s too simple. 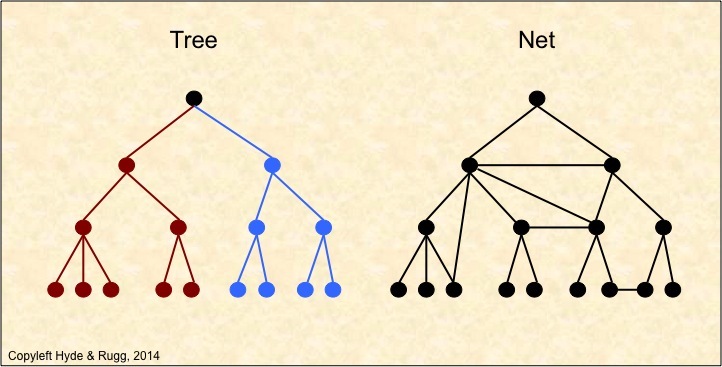 The same goes for using a graph-theory tree as a representation. The experts’ knowledge often isn’t a tree. In graph theory terms, the experts’ knowledge is often a net. That’s significantly different from a tree. It’s more complex, and it’s less neatly structured. In a net, branches can re-join, as in the example above. This has a huge range of implications both practically and in terms of formal theory. The bottom line is that the knowledge pyramid rapidly stops being useful when you start getting involved with the detail of how human knowledge actually works in real, nontrivial cases. It’s no accident that a lot of the popular claims about learning and knowledge use examples from tightly bounded artificial fields, such as chess, where the principles and issues are simple and clear-cut. Unfortunately, the world is rarely simple and clear-cut, so modelling it properly requires something more powerful than pretty simplifications. The knowledge pyramid is a useful concept, provided that it’s used within its range of convenience (i.e. the range of contexts within which it can be meaningfully applied). 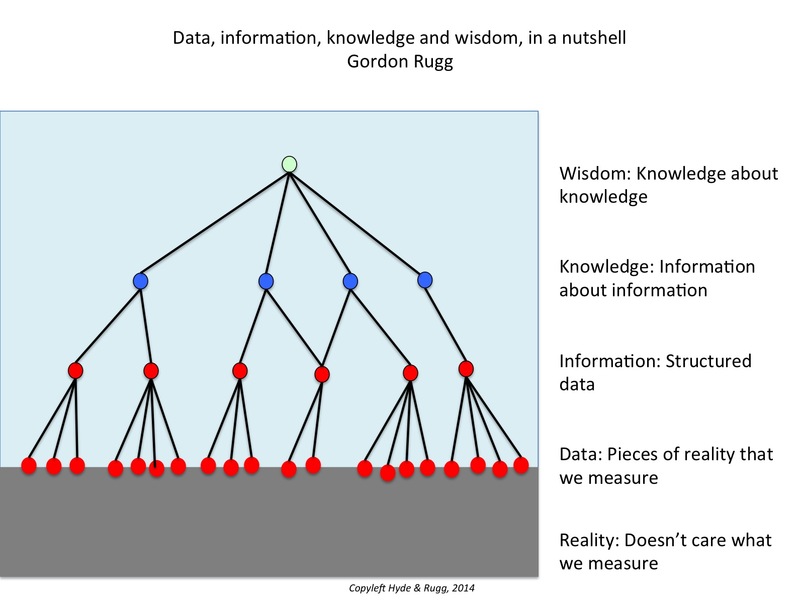 It’s a neat, simple way of representing some important principles, such as the principle that there are differences in scope and nature between data, information, knowledge and wisdom. It’s useful for conveying the concept that “knowledge” in the broad sense can be structured and categorised. It is, however, very much a simplification. If you want to structure and categorise knowledge in the broad sense for any practical purposes, whether those purposes are in education or in software design or any of the other fields where this structuring is applicable, then you need to go beyond the simplified version, and use the proper specialist concepts. We’ve already seen several of the specialist concepts in this article, in the form of trees, levels and nets. They’re simple concepts, but extremely powerful; there’s an extensive, sophisticated body of graph theory that can be drawn on for more power, as in the example of showing formal chains of reasoning in our earlier article on argumentation. Another set of useful concepts comes from the literature on expertise, which we’ve mentioned in passing in numerous articles. That literature has produced a clear and usually surprising set of findings about the nature of expertise, and about how experts are different from novices. Again, these concepts are simple but powerful – for instance, the finding that experts’ organisation of their knowledge is different from novices’ organisation of their knowledge. The last set of specialist concepts I’ll mention in this article relate to how people learn about data, information, knowledge and wisdom. One subset of these concepts relates to types of learning – in particular, implicit learning, which appears to have been misinterpreted by some in the popular literature as “natural learning”. There’s an extensive literature on learning, based on painstaking empirical research, that goes back well over a century, and anyone writing about teaching and learning should really be familiar with the key concepts from this literature, such as the role of variable reinforcement. The second subset of these concepts relates to the nature of the “knowledge” involved – for instance, knowing that knowledge often involves heuristics, which are required for dealing with incomplete and/or unreliable information. In short, the knowledge pyramid is a simplification, and shouldn’t be used as a basis for any theory or policy development. However, for anyone wanting to develop theory or policy, there’s a well-established set of powerful methods and concepts available that provide much more solidly grounded support and frameworks. We’ve already blogged about most of these, and we’ll be blogging about the others in future articles. 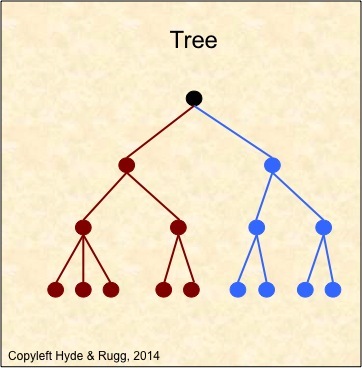 This entry was posted in categorisation, education theory, error, expertise, metalanguage, visualisation and tagged facts, hierarchies, knowledge pyramid, knowledge representation, levels, nets, trees by hydeandrugg. Bookmark the permalink.